A towering "rain control" site, where shamans would have asked the gods to open up the skies centuries ago, has been discovered in South Africa. 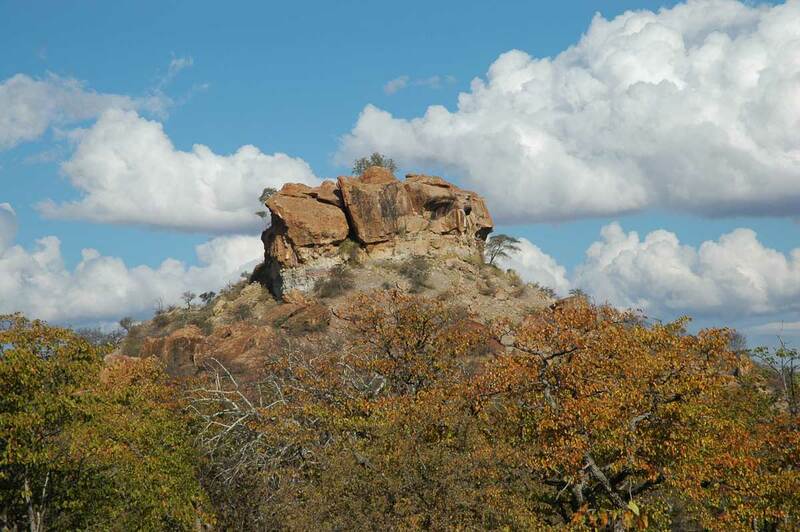 Located in a semiarid area of the country, near Botswana and Zimbabwe, the site of Ratho Kroonkop (RKK) sits atop a 1,000-foot-tall (300 meters) hill and contains two naturally formed "rock tanks." These tanks are depressions in the rock created when water weakens the underlying sandstone. When the scientists excavated one of them, they found over 30,000 animal specimens, including the remains of rhinoceros, zebra and even giraffe. "What makes RKK special is that every piece of faunal material found at RKK can in some way be linked to rain control," researcher Simone Brunton, a doctoral candidate at the University of Cape Town, wrote in an email to LiveScience. The shamans, or religious leaders, would have ascended to the top of Ratho Kroonkop through natural tunnels (fissures) in the rock. When they reached the top of the hill, they would have lit a fire to burn the animal remains as part of their rainmaking rituals. The people who conducted these rituals were from the San, an indigenous group in southern Africa who lived as hunter-gatherers. "They were San rain controllers who were employed by the farmers to control the rain," Brunton explained. The farmers, in turn, depended on their chief to make sure this arrangement went smoothly and that they did, in fact, get rain. Access to the rain-control site would have been strictly controlled. "The shaman or ritual specialist was usually the only one directly involved with the actual doing of the rituals. It would have been strictly forbidden for normal folks to go near the site," Brunton wrote in her email. The site "was placed away from society because it was seen as very dangerous or 'hot,' and any interference would cause the gods to be angry." The team's findings were reported in Issue one of the 2013 volume of the journal Azania. Brunton and her colleagues used ethnographic studies to determine the importance of the different animals at Ratho Kroonkop for rainmaking. Some of the animals, the team found, were sacrificed for their fat. "Many San believed (and believe) that fat contained a high concentration of supernatural potency," the researchers wrote in the Azania paper. For instance, the rhinoceros remains the team found were mainly from the animal's lower extremities. "People were taking the lower parts of the rhinoceros, in the region of the leg and thighs. These parts of the animal contain a lot of fat and meat, which is linked to potency and power," wrote Brunton. Other fatty creatures they found at the site include the rock hyrax, a bushpig and what might be the remains of an eland. "In San cosmology, the eland was the most potent animal; killing one would give the shaman immense power to ask the ancestors for rain," Brunton wrote in her email. Maria Schoeman, Brunton's supervisor and co-author of the study, originally surveyed the area as part of her doctoral work. "We were originally interested in [Ratho Kroonkop] because we found rock art at the bottom of the hill and decided to investigate it further. We climbed up the hill, and that was when we found the mound of bones contained in the rock tank 2," Brunton wrote. Dating the excavated rock tank has proven difficult, as it contains a termite mound, and the insects may have moved some of the smaller objects. It's also possible that Ratho Kroonkop was used as a rain-control site before the rock tank was in use. Brunton said the history of the region, and the rock art at the site, may provide clues as to exactly how long the site was in use. "The site was possibly used by hunter-gatherers for many years, as there is San rock art at the bottom of the hill. Over time, farmers came onto the landscape and knew that the site was sacred in San cosmology; they would hire the San shamans to control the rain, but also left their own marks on the site by painting their own sacred animals over the San art, adding power to their own animals," Brunton wrote, adding that farmers were in the area by A.D. 1000. "The way I see it is that this site could have been used over many years, but this paper is a snapshot in time for one of many periods of occupation/use," Brunton wrote.